This scene commemorates a performance of the play Tōkaidō Yotsuya kaidan (東海道四谷怪談). 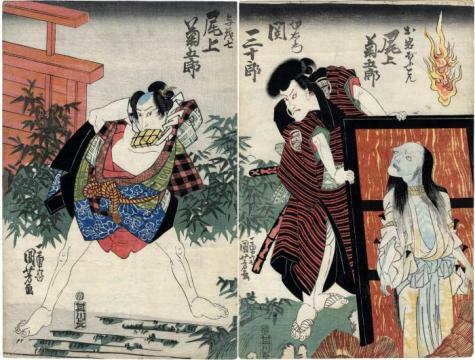 Here Onoe Kikugorō III is portrayed as both Oiwa's husband and as the hideously deformed ghost of his departed wife. In Edo Kabuki in Transition: From the Worlds of the Samurai to the Vengeful Female Ghost by Satoko Shimazaki there is a wonderful description of the multiple roles Onoe Kikugorō III performed in a single play. There is also an reference to the use of one on the figures in the Chūshingura as the husband of Oiwa. "Of course, at the same time that Nanboku was alluding to Kikugorō III's distinguished acting lineage, he also was presenting Kikugorō's own talent as a multiple-role actor and exploiting it to the fullest. In addition to playing Oiwa and Kohei, Kikugorō took on a third role as Satō Yomoshichi, a loyal retainer of Lord En'ya who ultimately kills Iemon. The actor critique A Beaded String of All the Best Actors: Osaka (Yakusha tamazukushi Ōsaka, 1826) gave a rave review to Kikugorō's performance, praising his ability to switch rapidly from one role to another: “Kikugorō did a fantastic job with Satō Yomoshichi, Oiwa's ghost, and Kohei. The horrifying scenes were even more exquisite than those of his father, creating effects so scary it made one's hair stand on end."